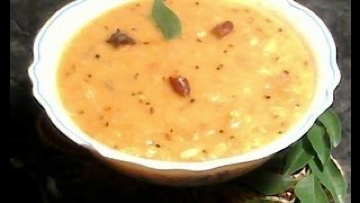 Mango dal with Moong dal or Mamidi kaya pappu is a very delicious and mouth watering South Indian side dish recipe. 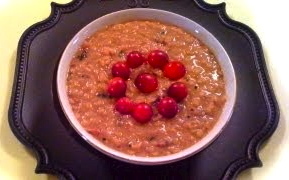 Temper the mango dal with ghee to enhance the taste and flavor. Wash & soak moong dal in water for 30 min. Wash, peel and cut mango into small pieces. Peel and crush garlic. Cut green chili lengthwise. Take moong dal in a vessel and add about 3 cups of water. Cook this on medium heat. When the dal is half cooked add cut mango, green chili, salt and turmeric powder. You may add 1/2 - 1 tsp red chili powder for more spiciness. Add more water if you need. Continue cooking on medium or low medium flame until both dal and mango are soft. While it is cooking make seasoning/ tempering. Take 1 tbsp of ghee in a small sauce pan and heat it up. When the ghee is hot, add mustard seeds and cumin seeds. Let them splutter. When they are spluttering add red chilli and keep stirring. When the red chili is changing color, add hing/asafoetida and curry leaves. Add this tempering to dal and give a good mix. Add some more water to get your desired consistency. Keep in mind that dal gets thickened as it gets cold. Continue cooking on low flame for 2-3 minutes and then turn off the stove. Serve this with rice or chapati.